The fact that a part of the synopsis says this is a Doctor Who meets Sherlock type of novel got my attention right away. How can I say no to anything that is compared with Doctor Who, I had no reason to say no to picking this one up. And in the end I'm glad that it did catch my attention, it was definitely an interesting read to say the least. I really enjoyed the idea behind this story, there is a great sci-fi aspect to the world that Ritter has created, an unknown murder and the suspect seems to be some supernatural creature. When Abigail meets Jackaby you can tell right away that he is an awkward person. Jackaby definitely has the Sherlock vibe to him, he does not have the greatest social skills but he is aware of so much around him. I loved the dynamic that Jackaby has with everyone around him, it makes the story very light-hearted and yet there is so much darkness still going on. As soon as Abigail arrives in town you can see that she has something to prove, not only to herself but also her family. The way she works so hard to show Jackaby she can be a help is amazing, I truly loved her perseverance to be Jackaby's assistant. I still want to learn more about Abigail and her family history, you can see that she is hiding a lot of herself and trying to become a new person. 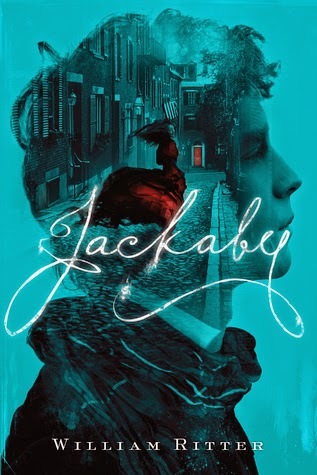 Though as the book finally comes to an end, you can see that Abigail still has quite a lot to learn about Jackaby, and I am excited to see what more William Ritter has for Abigial and Jackaby, I can already tell there are going to be a lot more great supernatural mysteries to come for these two. I think if you are a fan of Sherlock and you like a bit of supernatural elements added in to your pot, then this would be the book for you to check out.